Vitalis- Tim started Vitalis as a young thoroughbred of the track and produced him to a very handy A grader which was placed at World Cup level. Vitalis was sold to Katie McVean as her Junior horse. Row Street- Another off the track thoroughbred which Tim produced to be the winner of 2 World Cup Qualifiers in Australia, as well as numerous Royal and Agricultural show wins across Australia. VL Jovial- started his career with Tim and was lightly campaigned by Tim before being sold as a Junior horse. ​junior / young rider horse. Tim had the pleasure of breaking in the 2011 Australian Showjumping Champion Wirragulla Nicklaus. Tommy Gun- Brought off the track, his a 1/2 brother to A Grade showjumper Cannan. Tommy was sold overseas as a reliable mount. The Patriot, ridden by Cherie and sold as a safe junior / Pony Club horse. 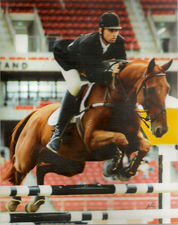 Ego Creighton- campaigned by Tim from a young horse to 1.30m before being sold as a young rider horse. Cryptique broken in by Tim and sold as a 3 year old. He has become a reliable and competitive mount. ​Myriah's Image- We brought Myriah at the Thoroughbred Sales because she is by Skilful Star which is also the sire of Cannon. Tim campaigned Myriah's Image to 1.15m before she became a broodmare. She is the grandam of Deja Vu and dam of Chivas. VL Chivas- was broken in by Tim and started in height classes with Cherie before being sold. Now he has become a wonderful Junior mount. VL Deja Vu- We bred Dylan and broke him in before selling him at two and half years old. He has now started his jumping career with Australian Young Rider Champion Madi Sinderberry. Together they are winning young horse classes around Australia. Cotrill- We bred Codie, he is a half brother to VL Nikkole. Codie was broken in and campaigned by Tim to 1.15m before being sold to be a reliable, fun mount, which is very competitive in Eventing. ​Premier Likadiamond is the dam of VL Azar Diamond and VL Geronimo. We bred VL Vanna, broke her in and sold her as a in-foal 3 year old, which will have her Cera Quantro baby then commence her showjumping career. VL Kate- a big athletic thoroughbred mare by Clangalang from the Greig mare Musical Choice.